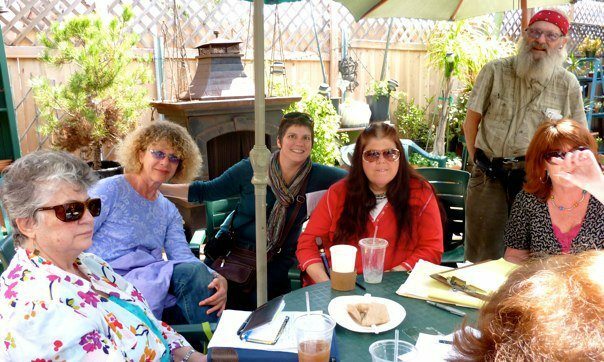 Coastal Coffee Party meets at Jungle Java. 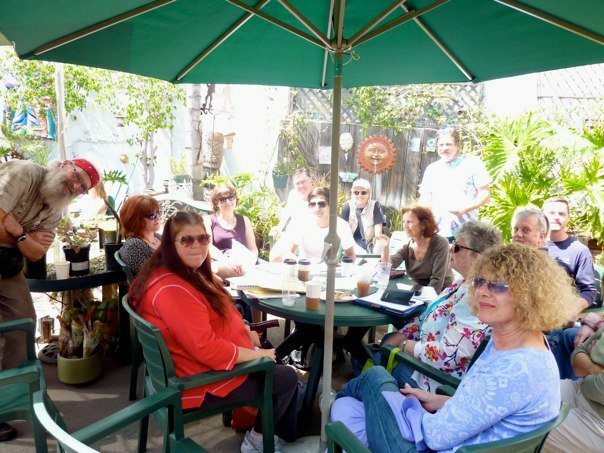 There we were, all 21 of us, crowding around under the shady umbrella at Java Jungle. And we were all talking politics – imagine! 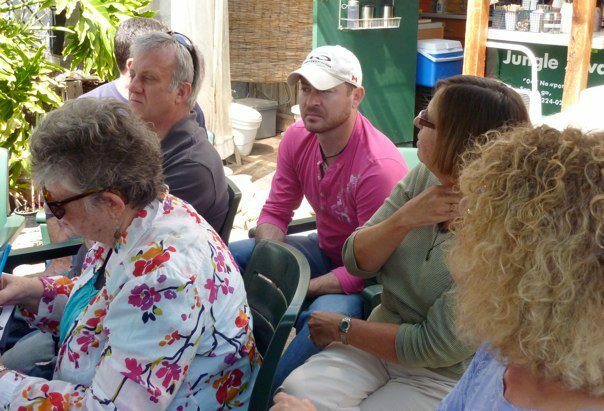 It was a meeting of the “coastal” section of San Diego’s Coffee Party movement, a movement that is barely two months old, yet already has nearly 400 chapters across the country. What started as a facebook rant about the incivility of American politics and the apparent stalemate in Congress, and which has now blossomed into a nation-wide movement, had its first San Diego meeting on March 13th. The turnout was so huge, that the group broke down into four sections. The focus of Saturday’s discussion was what handful of issues did we want to take to Congresswoman Susan Davis, our representative? Congress took its Spring break right after their vote on the healthcare bill. It’s the Coffee Party’s priority nation-wide to take on our Congressional representatives and give them a ear-full – civilly of course. And currently, we are trying to set up a community meeting with Cong. Davis, for sometime in mid-April. We went around the table and about a dozen of issues were offered up. They included health care reform, truth in media, immigration, campaign finance reform, Wall Street reform, unemployment and jobs, the war in Afghanistan, funding our cities, farm subsidies, legalization of marijuana, the ‘don’t ask don’t tell’ gays in the military policy. After about forty-five minutes, we had boiled these down to about 3 or 4 primary issues. We still wanted to push for health care reform, but felt we wished to address a few other issues. Campaign finance reform was a big topic. Ever since the recent US Supreme Court decision allowing corporations “freedom of speech” and to spend whatever they wanted on most elections, our democracy has been in dire peril. Everyone at the table agreed this had to be overturned. Unemployment and jobs was another huge issue for us. In addition, we combined a call for de-funding the Afghanistan war with a call of funding our cities as our third issue. Lastly, we wished to discuss with Davis her stance on the current Farm Bill regarding the subsidization of agribusinesses. But one thing united all of us and most of these issues: it was the fact that corporations are taking over our country. Whether it’s healthcare, the Farm Bill, the media, it was apparent that the people are being usurped. We want to ensure that Susan Davis always votes on the side of the people before corporations. People over corporations became the theme that pulled all of this together. This “coastal” chapter will stay together and will send coordinators to a meeting with other coordinators of the other sections to work out some of the logistics. We decided to meet again after the mid-April get together with Susan Davis. There was supposed to be 400 Coffee Party meetings across America that day. Well, there was four in our county alone. There is a national website, a local facebook and a local website. What began as an alternative to the Tea Party is definitely gaining steam. And who knows – what with the onerous display of Tea Partism last weekend toward member of Congress, their loss may prove to be our gain. I have met Congresswoman Davis on numerous occasions, lobbied her office with phone calls, letters and visits. I find Congresswoman Davis to be a kind person who listens, and is very cordial. That on a personal level. I am continue to be troubled, however, by the votes she has taken, which have frequently put corporate interests (HealthNet, SAIC, General Dynamics, Cubic, Epsilon) — above people. A short study of the large campaign donors to Congresswoman Davis may be highly informative.